Events — Modern Milk - Happy Mom. Happy Baby. Grab a girlfriend (or come solo and make a mom friend!) and join us for Wine Down Wednesdays! Enjoy our Restorative Yoga Class at 7:15pm (a 45 minute session of Yoga Nidre is equal to 3 hours of sleep!!) and then head a couple doors down to Squarz Bakery & Cafe for a $5 glass of wine or beer. No Yoga experience needed. 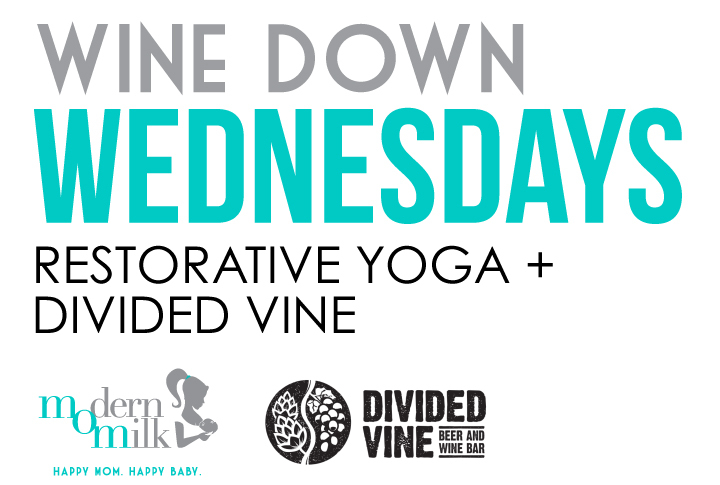 Come relax, meditate, sip and socialize with other Modern Milk Mamas. Your first Modern Milk Fitness Class is always free! Enjoy our Restorative Yoga Class at 7:15pm (a 45 minute session of Yoga Nidre is equal to 3 hours of sleep!!) and then head a couple doors down to Divided vine Beer and Wine Bar for a $5 glass of wine or beer.